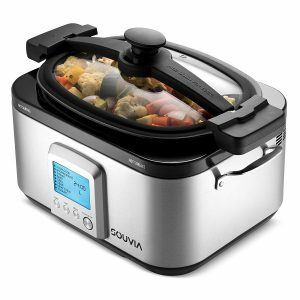 Magic Mill Souvia (MSC-9555) is an eight in one multi cooker with a 7-quart capacity and a powerful 1500 watt motor (120V, 60Hz). 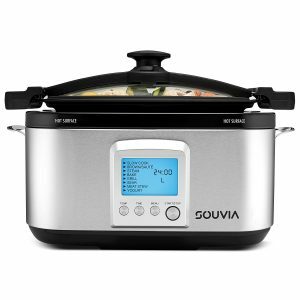 Souvia is one of the better selling multi cookers on Amazon at the moment and the average rating out of 54 customers’ rating is 4.7 out of 5. You have the option to get it as a 6 qt size 5 in 1 cooker with a different display panel and with a non-locking lid. And that one costs fifty dollars less at the time of this review. The package weighs 15.2 pounds and measures 20 x 13.5 x 12 inches. It has a smart LCD-backlit panel with Temp, Time, Menu, Start/Stop buttons and a large blue-backlit display that shows the time and temp as well as whatever cooking option you choose. These 8 preset functions include Brown/Saute, Meat Stew, Slow Cook, Grill, Bake, Steam, Sear, and Yogurt. The lid locks safely so you can move and relocate the cooker easily by holding its easy carry handles. You will be replacing a variety of bulky cooking units in your kitchen like your Dutch oven, grill pan, roasting pan and slow cooker by owning this crock pot multi cooker. So there will be more free space for your other stuff on your bench. You can roast, grill, sauté, bake, steam, defrost frozen stuff directly from the freezer and make yogurt with the preset settings that you can control via the LCD display panel. It has a brushed stainless steel exterior, a dishwasher-safe non-stick ceramic inner pot, a tempered glass cover and includes a metal rack. It will make life easier for those with busy lifestyles and without much of chef or cooking skills. All you need to do is put your ingredients into the pot set the time and temperature and your meal will be ready waiting for you when you get home from work. The fact that the detachable cooking pot is non-stick and dishwasher-safe make cleaning so much easier as you won’t need to scrub anything. And the whole cooking process with this crock pot is without making any mess in your kitchen, except for the ingredient preparation. You can rinse it by hand in your sink or directly put it in your dishwasher. With the warming option, you can keep your meal warm and bring it to the table, ready to serve your family and guests. The handles can get a bit hot, so you will probably need to use a mitt but the cooker itself- the sides are nicely insulated. They could use a heat-resistant silicone on the metal, but they didn’t. This ETL -listed modern cooker is completely safe to use as it comes with a variety of safety features including a locking system on the lid and anti-slip feet. You will be eating lots more of the tasty, healthy and nutritious meals rather than fried foods with the Souvia. You can broil, steam, bake, roast, grill, slow cook a variety of ingredients, cook a whole chicken, make crusty bread, steam rice, and make yogurt. One of the customers commented that the cord could be a little longer, as they don’t get much flexibility for where they can put the cooker on the counter. It comes with a clear and easy to read instructions manual and the controls and the LCD display are also quite easy to read and understand. It offers a great deal of flexibility and control over what you can do(when and how you want to cook), seems to do the job very well no matter what you do as long as you stick to the instructions, food does not stick to the pot at all and cleanup is very easy.